The Power Rangers Legacy collection will feature the first twenty seasons of the show gathered on ninety-eight discs. I'm just going to put it out there that the Power Rangers, no matter which iteration you subscribe to, are about the most ridiculous thing ever. That doesn't mean we don't love them. In fact, were you to jump back (preferably in multicolored energy beams) to the early 90s when the series debuted, you'd probably find us chanting "Go! Go! Power Rangers!" like every other American child with a television. If you're still keen on "teenagers with attitude" today however, the folks at Shout! Factory may have just unveiled your must have commodity for the holiday season. The Power Rangers Legacy: The First 20 Years collection is, as its name suggests, an anthology of the first twenty seasons of Power Rangers. Beginning with the Mighty Morphin Power Rangers, the set runs all the way through to Power Rangers Megaforce. While this massive collection would probably be enough to sate even the most extreme of Ranger addicts, things get even better when you learn about the packaging. Rather than just sticking the included DVD's in some run-of-the-mill box, the folks at Shout! 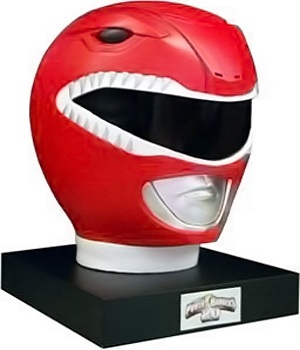 Factory instead created an exact replica of the original Red Ranger's helmet that doubles as a case for the ninety-eight disc collection. "We actually got the original helmet used in the show, did a 1:1 digital scan of the helmet, created the file, then sent that off to the vendor, who was able to create a clay sculpture of it," said Brian Ward, who worked on the collection. While we personally would have gone with the Green Ranger, you'd be hard-pressed to deny how neat the packaging is. The caveat of this coolness however, is that the Legacy collection will be fairly limited. Shout! Factory will only be producing two thousand copies for distribution. While details on pricing have yet to be released, the the collection will become available on December 3rd, 2013.